I obviously do way more cooking than I have time or inclination to write about here. Many posts get put on the back burner so many times that they are out of season before I have a chance to come back to them; others were pretty good meals that I just can’t muster up pithy comments for. So I’ve decided to institute a new periodic series: Leftover Night, my way of cleaning out the virtual fridge from time to time. Our first Leftover Night dish was nothing really innovative, just a pretty tasty pasta dish that made way more food than we could eat. 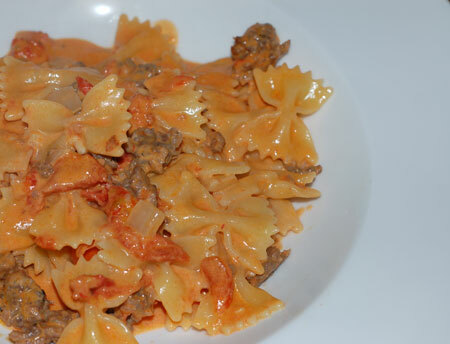 I raided the freezer for the Italian sausage I had leftover from making last month’s lasagna, and paired it up with some tomatoes, cream and bowties. My only adjustment to the original recipe was deglazing the sausage, onions and garlic with a little white wine to hit some of the alcohol-soluble flavors in the tomato. I cut this recipe down a little in size and we still had two days worth of leftovers, but it reheated pretty well with a splash of cream to freshen it up. I was looking for something really quick to make with chicken that wasn’t dead boring, and ended up making a Rachael Ray recipe, for heaven’s sake. 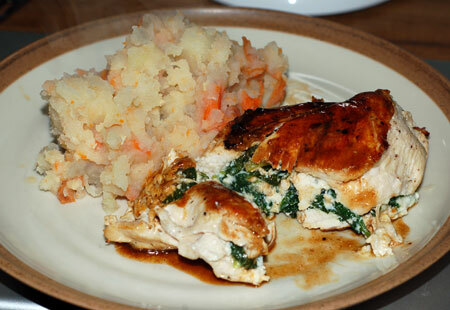 It’s spinach-ricotta stuffed chicken (sans mushrooms); I simplified the sauce and just did a quick white wine reduction. I can’t look at the picture without recalling that the mashed potatoes, which had a few carrots and some garlic thrown in for interest, were practically a salt lick because my hand slipped while I was seasoning them. It made me wish I’d cooked extra chicken, which turned out well: I wilted baby spinach with the onions for the stuffing, seared off the stuffed breasts, and popped the skillet in the oven at 400F to finish cooking for a few minutes while I was busy hypersalinating the potatoes. 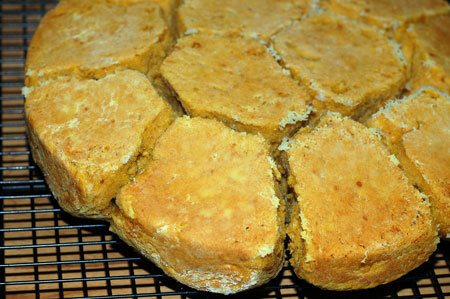 These sweet potato biscuits were the biggest success of the bunch. I had most of a can of organic mashed sweet potatoes open from Nolan’s lunch, and hybridized a Good Enough to Eat recipe with my standard buttermilk biscuit recipe to accompany some roasted cauliflower soup. Combine all dry ingredients from 2 C flour to Sucanat in a food processor, and pulse to blend. Cut 7 T of the butter into small pieces and add to the dry ingredients; pulse until butter resembles small peas. Add sweet potatoes and buttermilk; pulse again just until dough forms. Butter a 9″ round cake pan and preheat oven to 350F. Pour about a cup into a shallow baking dish and scoop dough by quarter-cupfuls into the flour (I use a dough/ice cream scoop to make this easier); roll to coat in flour and pat gently to brush off the excess. You should end up with 12 floured biscuits in the cake pan; melt the remaining tablespoon of butter and brush their tops liberally. Bake at 350F for 20-25 minutes, until golden. Turn out onto a cooling rack, separate gently, and allow to cool for several minutes before consuming, preferably with butter and honey. Source: Heavily adapted from The Good Enough to Eat Breakfast Cookbook.